I generally still make an effort to cook while traveling if the accommodations will allow it. Our gracious hosts fed us lunch most days while we were in South Africa spending our days in the cellars at Overgaauw Wine Estates. Nicole is a wonderful cook and though we sincerely appreciated their generosity, we didn’t want to take advantage of their hospitality so I tried to contribute here and there! 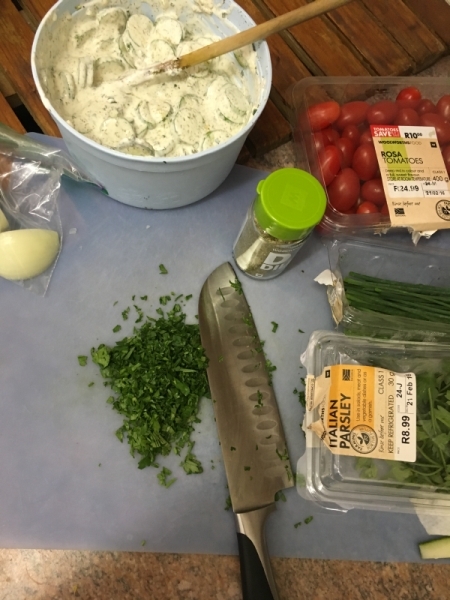 Sticking to my philosophy of preparing dishes with ingredients that I have on hand, I got creative with the assembly of the meals, which turned out pretty good! 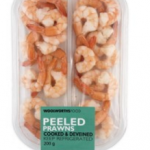 There were a few different options nearby to purchase groceries at including supermarket chains Checkers, Spar (also Super Spar), and WOOLWORTHS. Each of these grocery stores was a bit different. Spar was the closest to our cottage and seemed to be most reasonable in price. Its name is also the root of the verb that means “to save (money)“. These are mid-sized supermarkets and are designed to fit in a niche between convenience stores and traditional supermarkets. Checkers is a supermarket chain that focuses more strongly on fresh produce offering a wider range of choice food items to a more affluent clientele, although I really felt like “Woolies” (as the locals call it) had more of a feel similar to our Byerly’s or Lunds, having that “rich or prosperous” shopper type of feel. It is a chain of retail stores that is one of the largest in South Africa. It incorporates a series of food stores, some of which are attached to department stores that in addition to food, carry homewares, clothing, and footwear. They are acclaimed the best store in customer care. Although we ate great seafood in many restaurants, overall I had a hard time finding much variety available in the grocery stores. 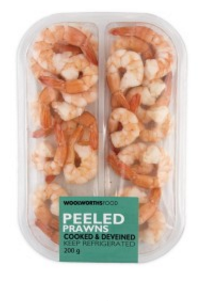 I found the shrimp at Woolies, but there were only a couple of packages. We also bought other white fish that was delicious, but seafood seemed higher priced then other proteins. 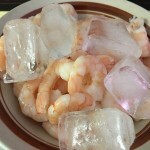 The Peeled Prawns 200g (about 1 lb.) were R 89.99 (about $6 a package). I used about a half a package of pasta. 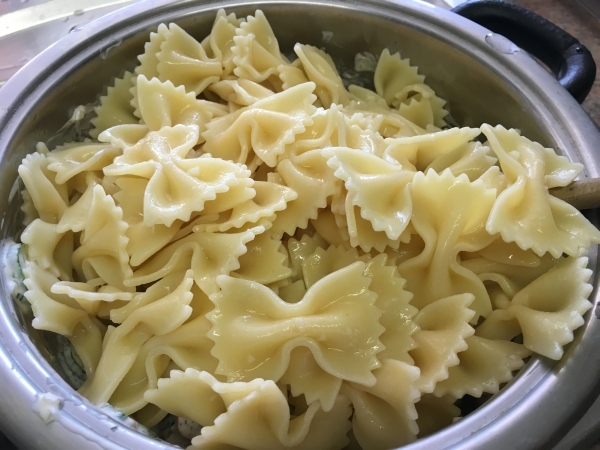 Cook the pasta in salted water according to package directions, removing from water when the texture is al denta. I drizzled with good olive oil so that the pasta wouldn’t stick. (Our lodging was on an olive farm after all!) Allow to cool completely in the refrigerator, covered. 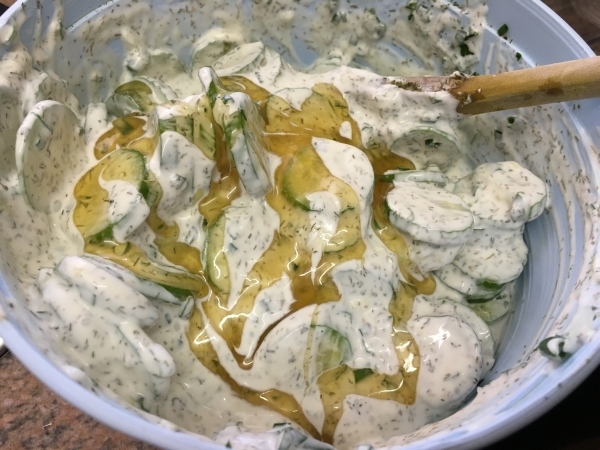 Combine the mayo, greek yogurt, and cream and mix well. Combine with minced onion and sliced cucumber. 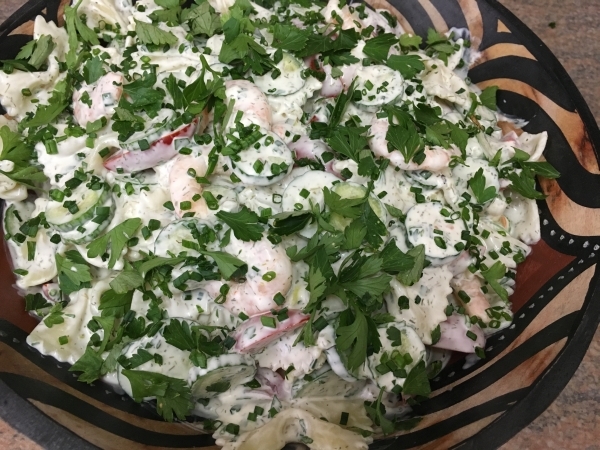 Stir in the dried dill (I would use fresh if available) and add the chopped parsley and chives, reserving parsley and chives for a garnish. Chop tomatoes in half. 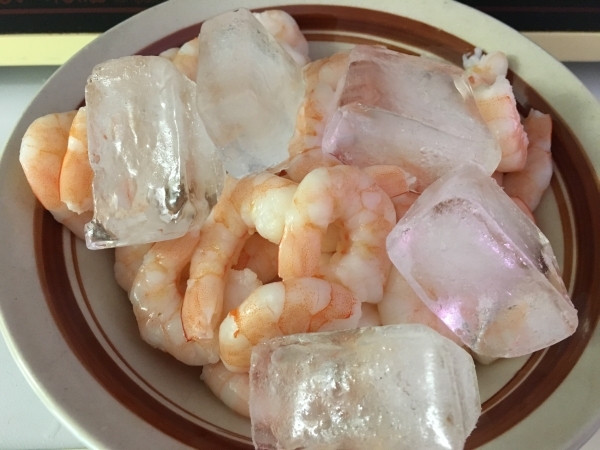 Remove the tails from the shrimp and keep them chilled on ice, but drain off any access water before adding them to the salad. Season the cucumber mixture with honey, to taste. 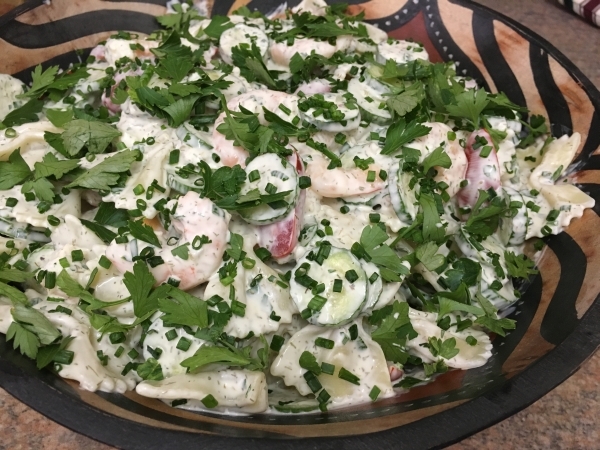 Gently combine the shrimp with the cucumbers and fold in the tomatoes. Garnish with chopped parsley and chives, serve chilled.